iPhone 7/Plus has toured the headlines once again as last year's huge hit iPhone 6s/Plus did, though they are improved slightly. We are sure now that the new iPhone, iPhone 7 features 4.7-inch 3D Touch display, A10 chips, improved battery life, iOS 10, Airpods, and bump the amount of RAM, surely bringing better and more convenient video playback experience. But iPhone 7/Plus's supported video formats are less likely to much differ from iPhone 6S or previous generations. So if you wanna play MKV, AVI, FLV or other videos on iPhone 7/Plus, you still need help. Wanna Watch MKV AVI FLV Videos on iPhone 7 iOS? Here the cutting-edge MacX MediaTrans can be your saviour, letting you directly transfer any video from Mac/Windows to iPhone 7/Plus without 3rd video converter (built-in video conversion feature). A 396MB MKV video to iPhone 7 only 140 seconds! One of the most popular iPhone 7 pros is that it starts with 32GB and also supports up to 256GB for files storage. So you can keep more funny and meaningful videos movies on your iPhone. 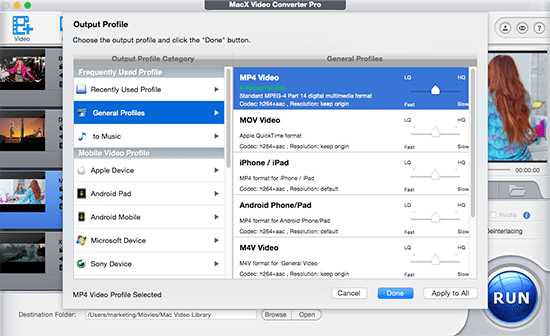 And MacX Video Converter Pro is at your fingertips to help you convert videos in 720P,1080P,4K UHD of any format, say, FLV, MKV, TS, AVCHD, AVCHD to iPhone 7/Plus supported video and audio formats, MP4, M4V, AVI, MOV, AAC, MP3, WAV, etc. in a blazing fast speed with no quality loss. Better still, it is also a video downloader, actually, allowing you to download movies to iPhone 7/7 Plus from YouTube, Dailymotion, Vimeo, Metacafe, and other over 300 sites. No worries about the absence of internet connection or the incompatible media formats, MacX deals with these jobs perfectly. Step 2: Go to Output Profile > Apple Device > to iPhone Video, choose the iPhone 7 preset profile. Or you can convert video to MP4 video formats for iPhone 7/Plus. Step 3: Click the "Browse" button to select a destination folder to save the output files. Step 4: Click "Run" button and start the video to iPhone 7 supported video formats conversion process. Free movies app for iPhone 7/Plus plays a big part if you are a movie buff, but your movie resource doesn't end here - you can watch movies DVD on iPhone 7 with the aid of MacX DVD Ripper Pro. The smashing DVD Ripper is able to rip any DVDs (homemade DVDs, protected commercial DVDs) to MP4, MOV, AVI, as well as any other formats with 36× faster speed and unchanged movie quality.